You know that warm feeling you get when you watch a person take a seed of an idea and transform it into a living, breathing reality? We’re feeling exactly that after talking with our customer Lexie Christian. 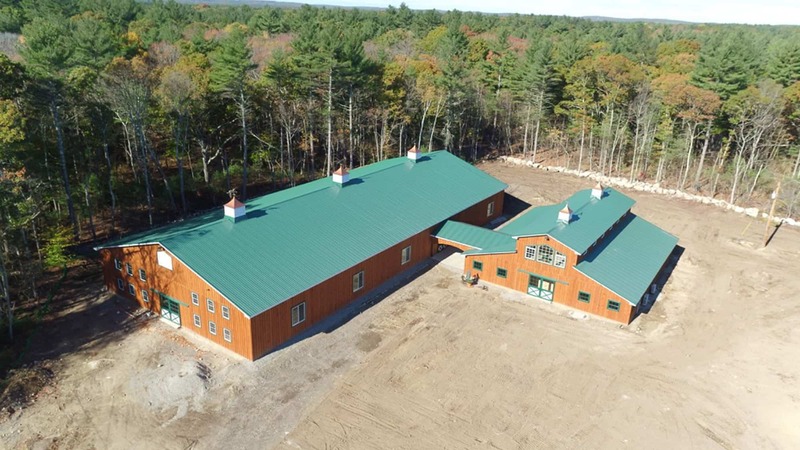 In September 2016, our team wrapped up construction of Lexie’s Amish-built barn and equestrian center, Elmwood Acres, in Mansfield, MA. We recently checked in with her to find out what impact the new facility has had on the community. Lexie says she’s seen firsthand how the equestrian center has helped the area. “The facility has opened the doors to lots of kids who previously had to travel far to take riding lessons,” she says. “Now they have easy access to local lessons of all kinds, including jumping and dressage. Elmwood Acres offers riding classes for children and adults, at all experience levels. The facility employs an experienced on-site trainer to provide the lessons as well as manage the center. It is also currently making plans to board horses for community members during the upcoming winter. The Mansfield area will continue to benefit from Lexie’s vision. She’s already working toward expanding Elmwood Acres’ offerings with additional paddocks and other features. Next year a dressage group, which attracts members from all over New England, will begin to use the center for training over the summer and fall months. Lexie says she’s also making plans to expand the facility’s offerings to include clinics and other equine-related events. The post-frame construction buildings include stout beams and joists, as well as tongue-and-groove planks and siding crafted from white pine we sourced from Pennsylvania. Our team traveled from Lancaster, PA to Mansfield to construct the facility over a three-month period. We also made sure to use concrete perma-columns instead of wooden posts for the foundation. This prevents the foundation from rotting, which increases the durability and longevity of the structure. Lexie’s dream of owning a top-quality equestrian center took root many years ago when her young daughter took up riding lessons. If you’ve been dreaming of building an Amish-built barn, equestrian facility, garage, or other structure, talk with us to learn how we can transform your vision into reality. Quarry View Construction, LLC d/b/a Quarry View Building Group. Copyright © 2018. All Rights Reserved.